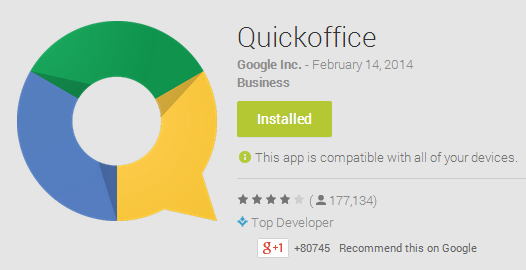 Google bought Quickoffice two year ago and re-released it as a free app with a nice UI. It is still one of the best mobile apps for editing Office files. Now Google has decided to discontinue QuickOffice since the company has added native Office editing to the new mobile apps for Google Drive, Docs, Slides and Sheets. "With the integration of Quickoffice into the Google Docs, Sheets and Slides apps, the Quickoffice app will be unpublished from Google Play and the App Store in the coming weeks. Existing users with the app can continue to use it, but no features will be added and new users will not be able to install the app," informs Google. Who cares when other Google apps can open PDF and Office documents easily. I think a standalone app is still needed. QuickOffice was a great app.